Do you wish to learn this fantastic dance? Are you a beginner to kizomba and want to learn more? Are you a dance teacher or kizomba dancer that wants to learn the kizomba method in order to teach in your town? Contact us if you want to organize a "kizomba event"! After 5 hours, anyone can dance to kizomba with a nice set of steps. Seminars for teachers! Do you want to start teaching kizomba? Due to our wide experience in teaching kizomba and developing our method, we have been doing more and more seminars for dance teachers who want to start teaching kizomba. 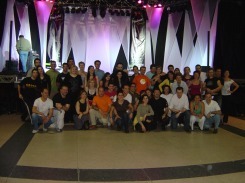 Salsa, ballroom and tango teachers are among those who are seeking this seminar the most. Our seminars include documentation, theory and practice workshops. The aim is not just to learn kizomba steps. Teachers are thought the method; based in it, they learn how to create their own steps and combos based on the progressive kizombadance method.